Below is a text version of the above video guide with a more detailed explanation of Feeds Reader's features and options. 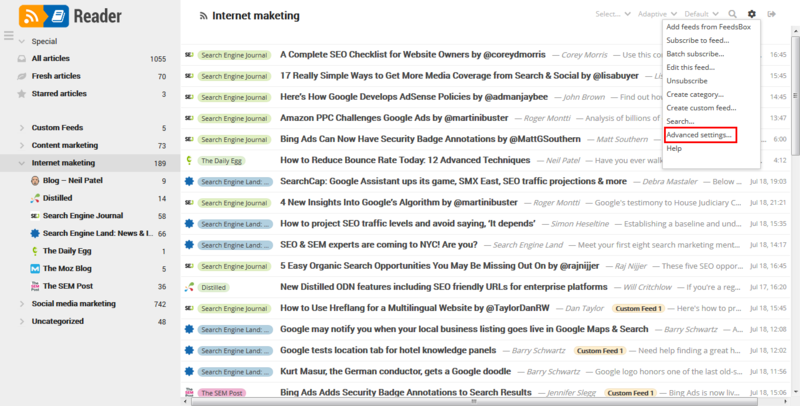 Feeds Reader is a very effective and undervalued way to consume content in the form of feeds. 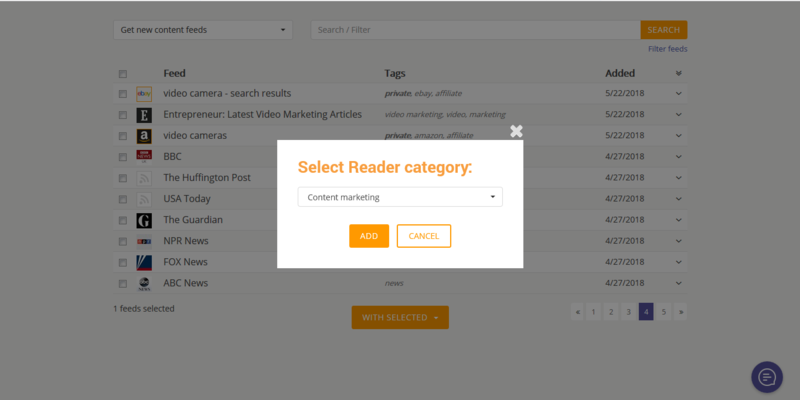 You can organize content feeds into categories based on their topic, content type, content source or any other parameter. You can mark feeds and articles as read, sort and filter them, use search option, add notes and tags to liked articles, mark your favorite articles and even combine them into your own custom feeds. It's content curation at it best! 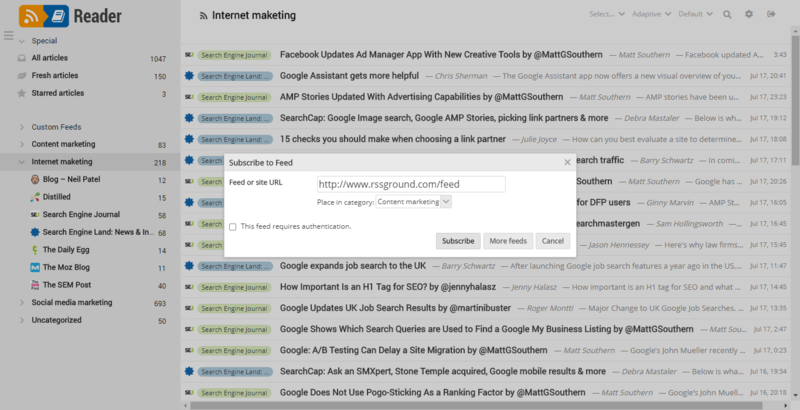 You can add feeds to your Feeds Reader either from Feeds Box or from any other RSS Ground content generator. Also you can subscribe to feeds via Feeds Reader itself. In this case they will still be automatically added to your Feeds Box. All feeds added through Feeds Reader will be considered as public feeds and will be a subject of membership plan limits. 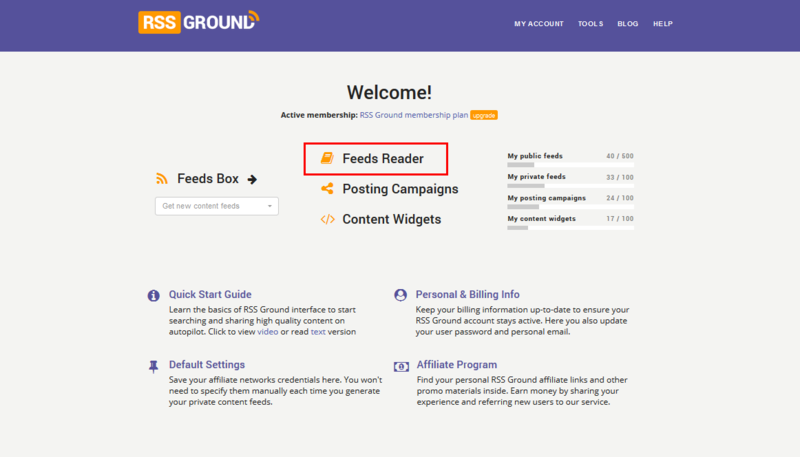 To start using Feeds Reader you need to sign up for any of RSS Ground membership plans including Basic (free). 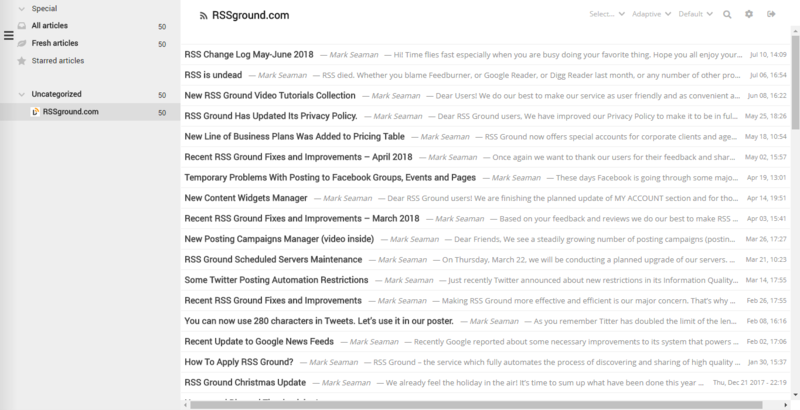 If you already have RSS Ground account, go to MY ACCOUNT and click "Feeds Reader". Let's start with creating a category for your feeds. 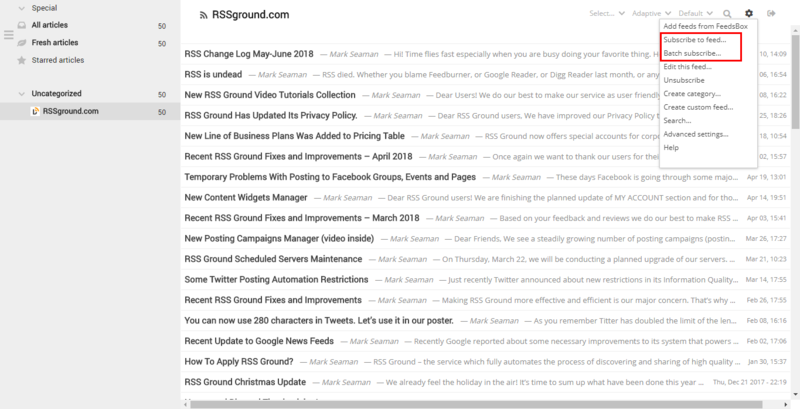 By default you have an Uncategorized category with official RSS Ground feed in it. To create a new category go to Settings menu and click on "Create category..." option. Name your category and press OK. You can create as many categories as you need. They will be listed in the left sidebar. And you can expand a category to see all feeds added to it. 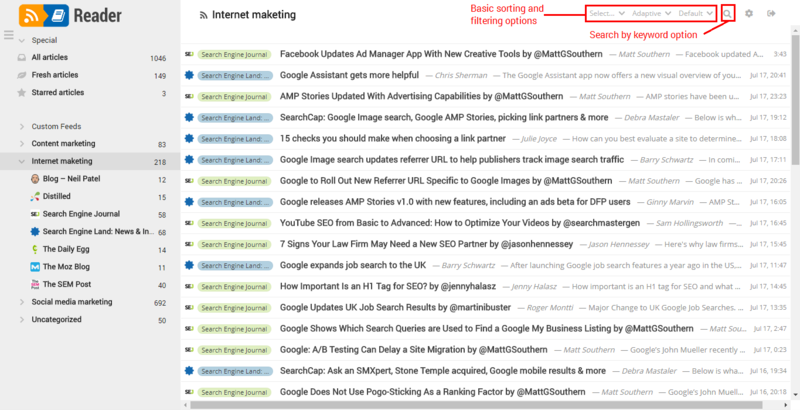 But before you can see your categories in the left sidebar you need to add content feeds to them. The easiest way to add feeds is to click on "Settings" icon in the top-right corner and then select "Add feeds from Feeds Box". You will be redirected to your Feeds Box where you can select feeds and send them to your Reader into any category. Another way is to manually subscribe to a feed's URL by clicking on "Subscribe to feed..." option. If you wish to manually add a whole list of content feeds into the same category, use "Batch subscribe..." option. Enter your content feed's URL and choose a category from the dropdown menu. Note: When you subscribe to a new content feed it may take up to several minutes to parse its content and display it in your Feeds Reader. To move your content feed to another category or completely remove it from your Feeds Reader, right-click on your feed in the left navigation bar. Then choose "Edit feed" option. Or choose your feed and go to Settings menu and click on "Edit this feed..." option. You will be able to choose another category for your feed, rename it, copy or edit feed's URL or unsubscribe and remove it from Feeds Reader completely. By default, all articles (items) from your feeds are sorted chronologically, with most recent at the top and show only titles. Click article's title to see the content. You can add your custom tags or notes to each article. 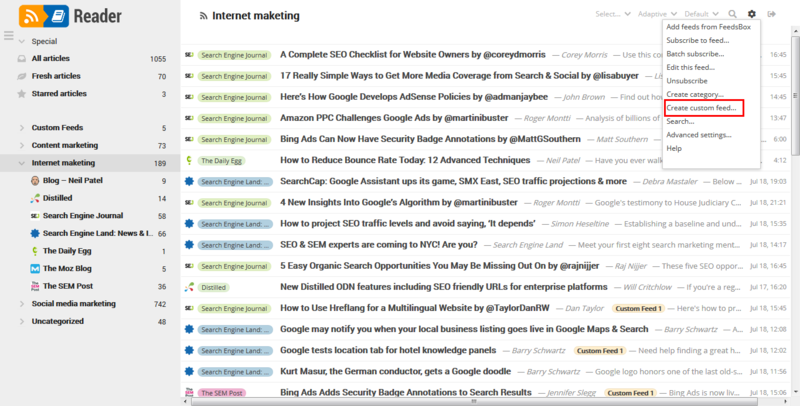 This will allow you, if needed, to filter all articles which have notes or organize them by tags. Also, you can star articles. And you can find these articles in "Starred articles" category in the left sidebar. For a better user experience, you can use sorting, selection, and filtering options from the upper menu. 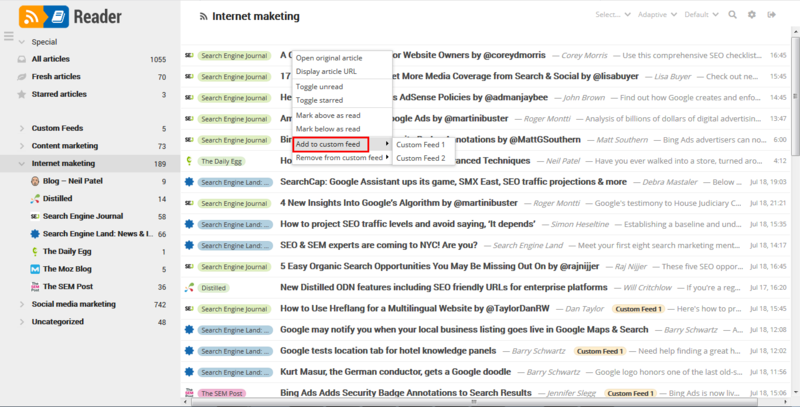 Use "Search by keyword" option to find relevant articles. 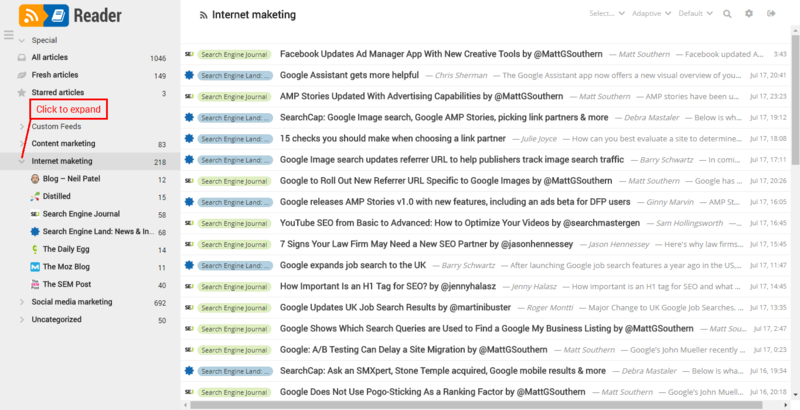 You can search all articles from all of your feeds, within a particular category or just in a single feed. 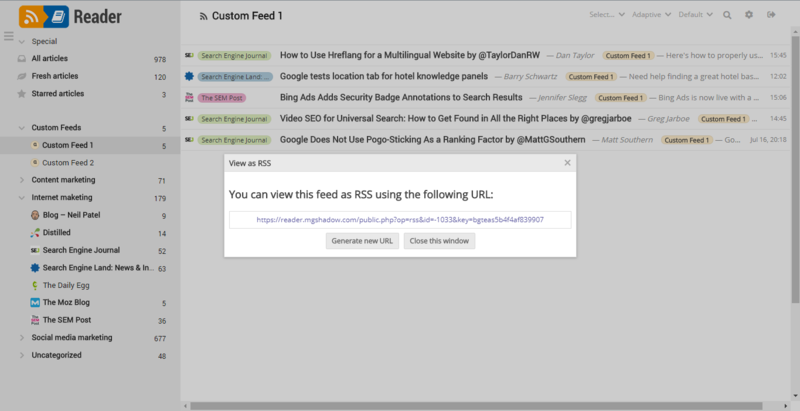 Learn more about Feeds Reader search syntax. We have already mentioned that you can star articles for any reason you might need to do so. 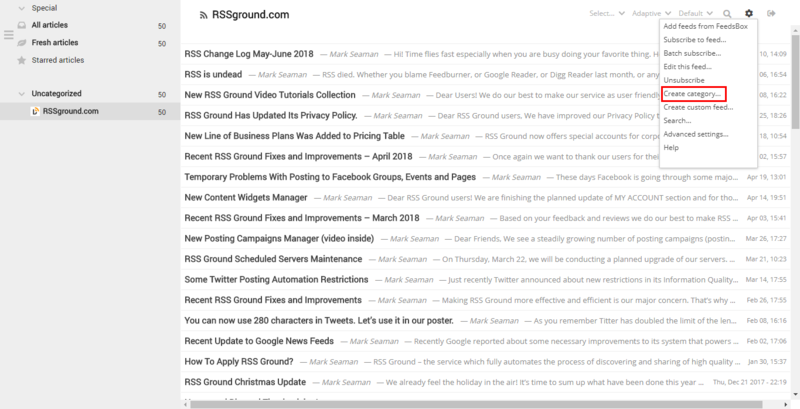 But we also have a far more advanced way to reorganize articles and to further use them in RSS Ground tools. It's called Custom Feeds. You can create and use an unlimited number of custom feeds, for example, one for each of your favorite topics, and then add liked articles to these feeds. To create a custom feed go to Settings menu and click on "Create custom feed..." option. Name your feed and press OK. 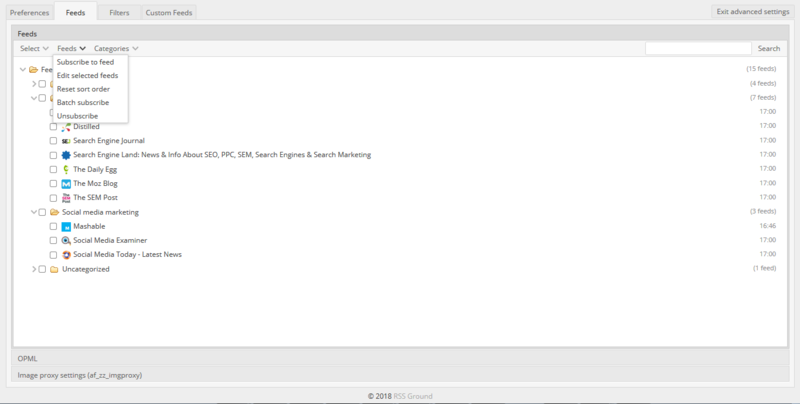 The beauty is that you can use these custom feeds to set up automated posting campaigns or add them to content widgets. 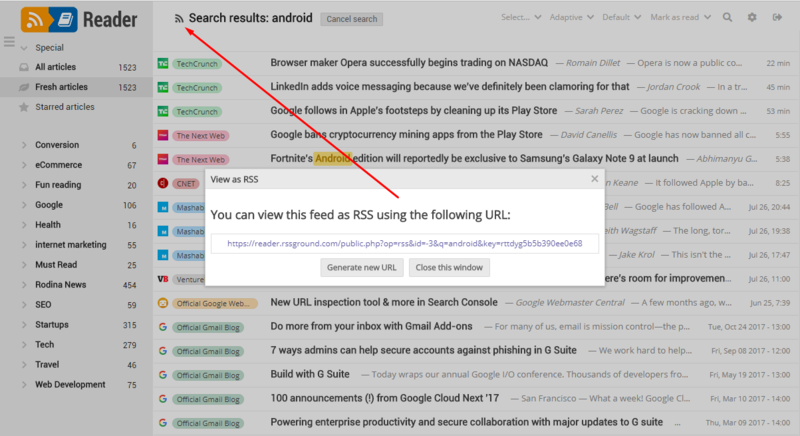 To get custom feed's URL, click on the feed you need and then click on RSS icon next to feed's title above the list of its articles. 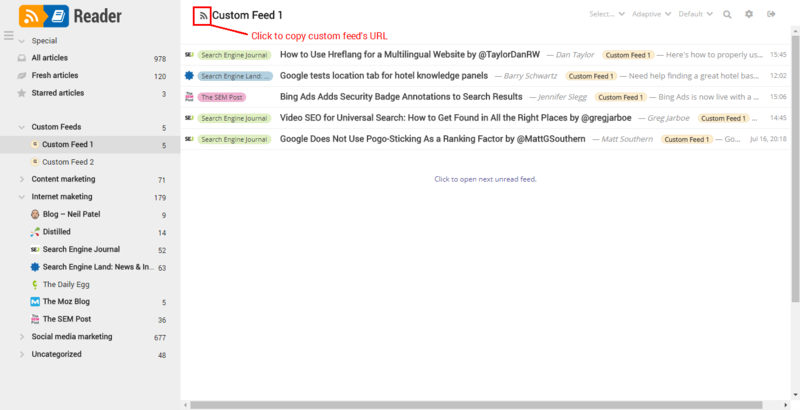 Now you can copy feed's URL. Use this URL in your posting campaigns or content widgets. 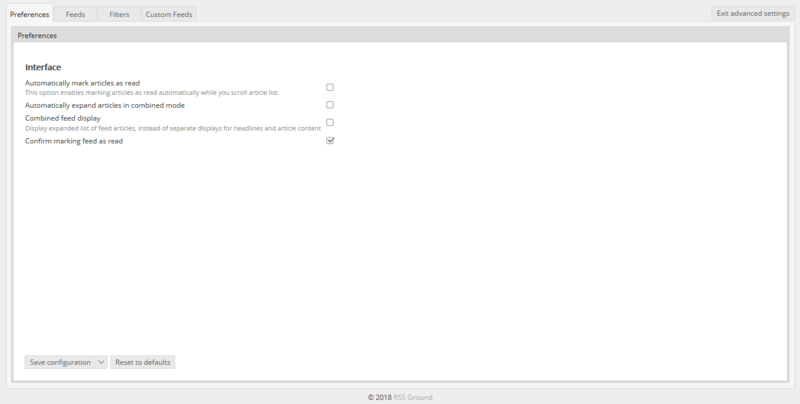 It will be automatically updated as soon as you add new articles to it. 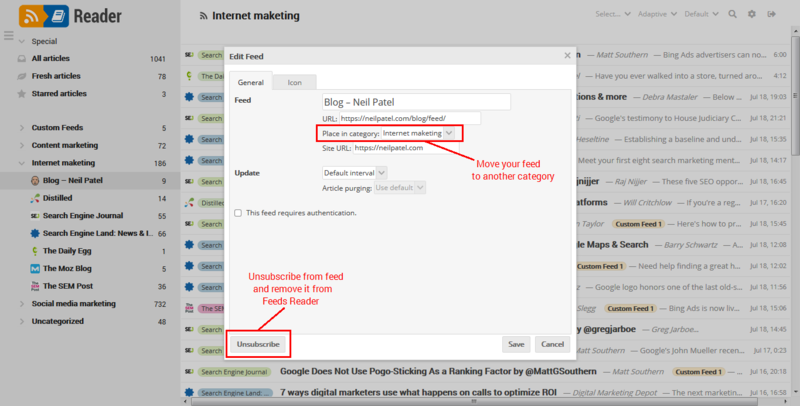 This is how you can fully control the content you post to your blogs and social media pages. The same way you can obtain a feed URL of any Feeds Reader's category, list of starred articles or even list of search results. Along with basic settings and options described above, we also offer you some "Advanced settings", which can be found by clicking on "Settings" icon. 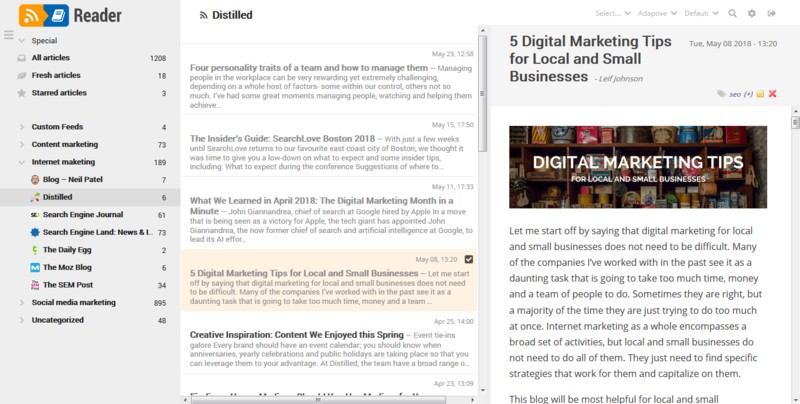 First of all, you can change the way you view your feeds and articles into split screen mode (Gmail style). Go to Advanced setting > Preferences tab. Make sure "Combined feed display" is unchecked. 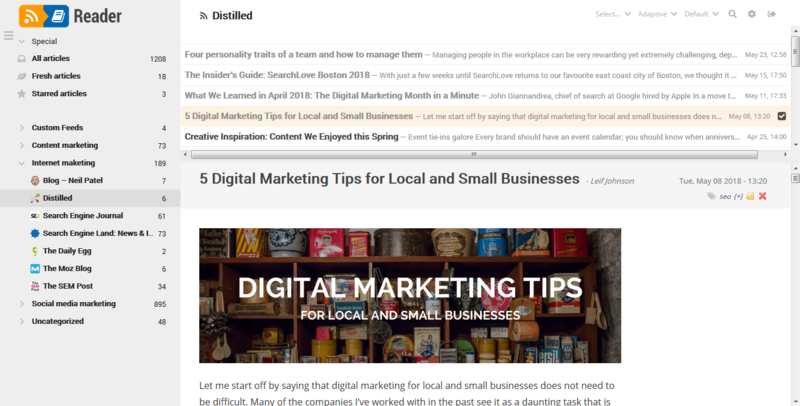 Now you can preview your articles still seeing the list of articles above preview window. For a vertical preview, go to Settings menu icon in the top-right corner and click on "Toggle widescreen mode". In Feeds tab you can drag and drop feeds from one category to another. There are some other useful options like bulk feeds editing (reassign a group of feeds to another category), batch (bulk) subscribe or unsubscribe. Here you can also rename or remove your categories. 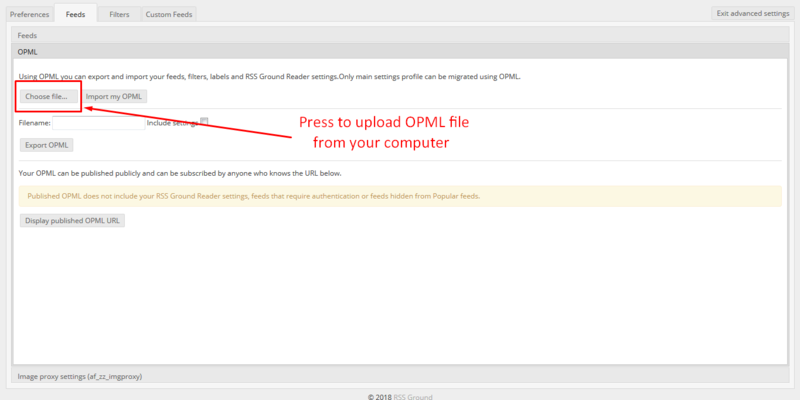 If you keep your content feeds in a different reader and this reader supports OPML option you can easily move your feeds to our Feeds Reader. Generate OPML file with all your feeds in your previous reader, save it on your computer. Now go to Feeds Reader, in Settings menu choose "Advanced settings" and then go to "Feeds" tab. Find "OPML" option on the bottom of the screen. 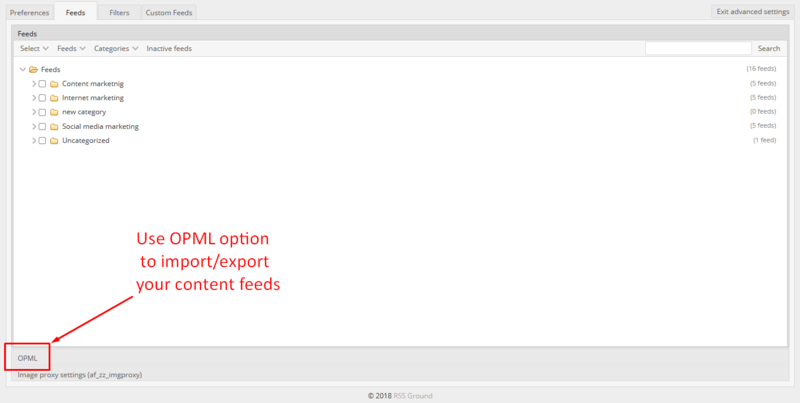 In OPML section press "Choose file..." button to upload your OPML file with all your content feeds. Filters are a very powerful and flexible feature which can significantly ease the task of processing targeted content from the sea of information coming through your content feeds. For example, you can set to automatically assign new articles which mention a specific keyword to a specific custom feed. 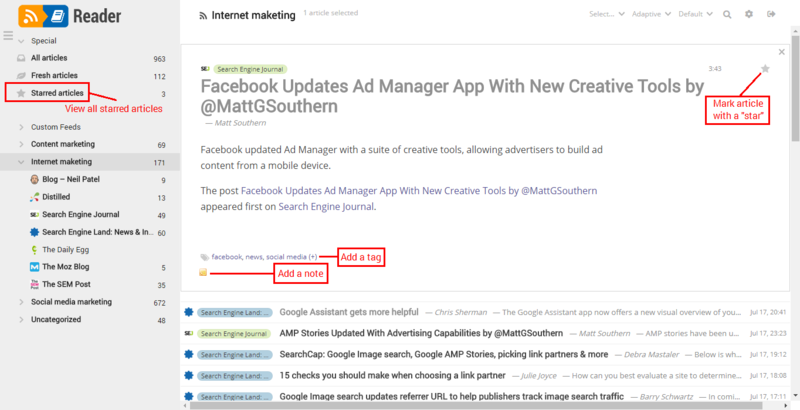 Or automatically mark as read or hide new articles which mention specific keywords. 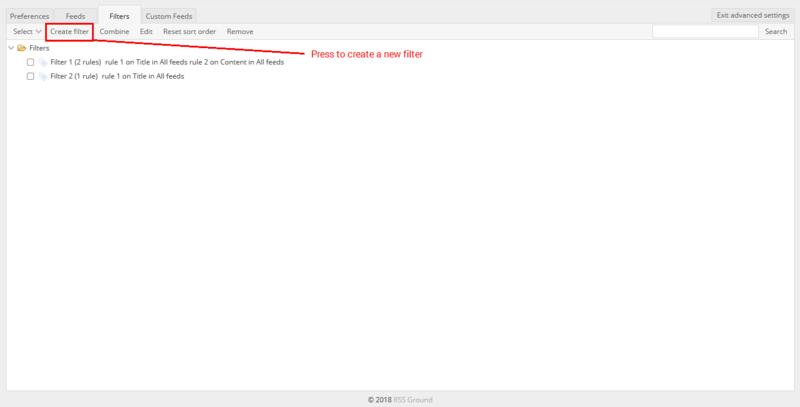 Go to Filters tab to set up your advanced filters. If you are familiar with Gmail filters these filters work the same way.